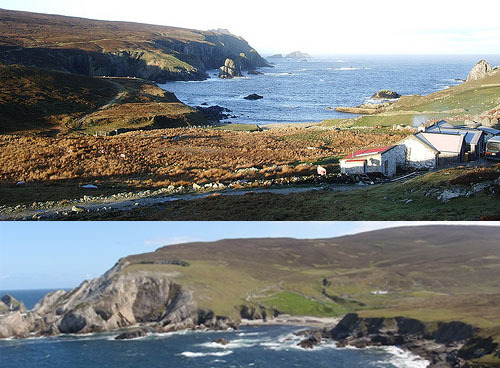 Our eight bed holiday home in Port, Donegal is offbeat, off the grid, and very nearly off the map. Right on the edge of the Atlantic, this eco rental cottage sits alone above the wild, smooth-stoned beach and tiny harbour of Port, Donegal. There is only one rough road into the place – and the nearest neighbours are three miles up the valley. There’s no mains electricity, so we generate our own, and keep warm with traditional stoves and ingenious hot water systems. See the bottom picture, little white blob centre right? That's us. In 1966, when on holiday in Donegal, Hugh Dominic Purcell walked over the hill from Glencolmkille and down into the valley of Port; he thought he’d stumbled upon a lost world. After long and complex negotiations, the family bought one of the ruins, threw on a roof – and it became our second Purcell home and retreat. 40 years later the scene at Port has barely changed , which is remarkable when you consider how much has happened in the rest of the world. Some might call it primitive, but we don’t. 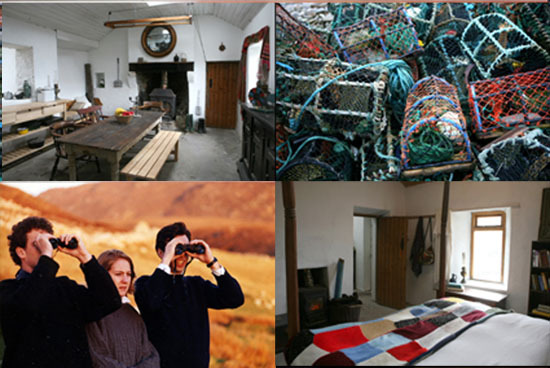 We think our Donegal cottage affords some of the greatest luxuries you can have in a crowded, busy world. It’ s miles from anywhere, set in one of the most unspoilt bits of country in Ireland – and the wild Atlantic practically smashes at the door. Holidays in Port, Donegal are sweet and old-fashioned – no electronic games, no tv - fishing, swimming, scavenging, messing in streams and waterfalls, walking your legs off , getting really muddy. No shortage of extreme sports either, like rock climbing the sea stacks and ocean kayaking. 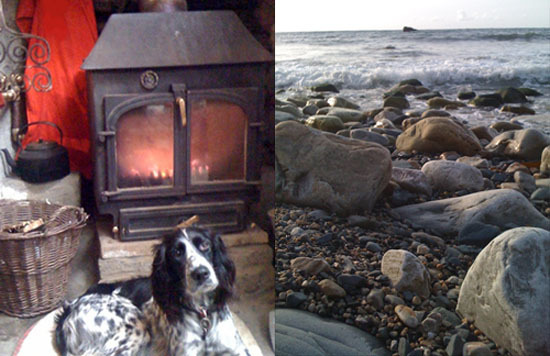 In the evening, we barge round the hearth for steaming chowders in the firelight. We have made a few concessions recently. We’ve put in running water, some basic alternative power and heating, which means it can be cosy – through Donegal summer,or winter and don’t tell anyone, but we’ve also joined two bathrooms and a kitchen to the back of the cottage. I say this quietly because up till now it’s been considered honour enough to be able to wash in a tin bath in front of the fire (while punishment of the day was washing up outside in a howling gale). Well, we still have the tin bath and the spirit of Port, Donegal lives on in and around it, strong and wild and very woolly. Please now have a Look inside the Cottage or see our latest videos , or go to About for the nitty gritty, including prices. And make sure you check out the Bog Blog to get an idea of what life at Port is really all about. Or if you have any questions, just contact me right away. No computers were harmed in the 0.119 seconds it took to produce this page.